We had another frost delay on the golf course this morning. My 8 a.m. tee time turned into a 9:30! But I had taken the day off for golf and was determined to play a full 18 holes. It was still a little on the cool side by the time I got to the first tee, but as long as the sun broke through the clouds I was comfortable. The secret to staying warm on the golf course is layering. Start with long underwear made of silk, add a long sleeved blouse or turtle neck and then a vest and a windbreaker. As the sun rises in the sky and the air gets warmer, you can start to peel off the layers. The real trick is to do all this with style. There’s no reason you shouldn’t look fabu even if you’re layering up. Recently I was asked to give some of my readers a chance to review the new fall “Cool Elements” fashions from Bette & Court and three readers eagerly agreed. Bette&Court has designed these long sleeve print polos in polyester and spandex. All have UPF of 50 for great sun protection. They are light, comfortable and easy to care for. Perfect for layering on those cool mornings. I like the styling and the material. Fit very well. It’s a beautiful shirt and would make a special gift. A little pricey, but certainly worth it. 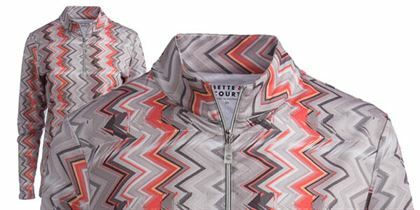 Bette & Court golf fashions are available online at the Bette & Court website. 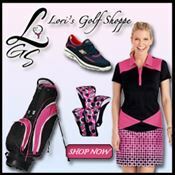 Also available through our sponsor, Lori’s Golf Shoppe. About Bette & Court: As A Company, The Process Of Constant Change Drives Us. Exciting New Designs, Fabric Innovations, And Cutting Edge Technology Are The Result Of Our Focus. But None Of That Matters Unless You’re Delighted Every Time You Wear One Of Our Garments. That’s Our Driving Passion And It’s Why We Come To Work Each Day. Founded in 1991, Bette & Court golf collection was purchased by Sport Haley, Inc., in 2010, an industry leader with a reputation for quality and service. 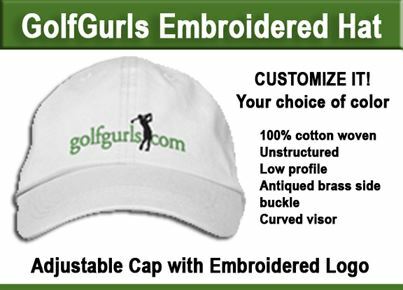 They are the longest running sponsor of the EWGA (Executive Women’s Golf Association: 19,000 women strong with 125 chapters in US, Canada and France).